Inclusion makes our profession stronger. 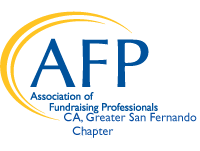 At AFP Greater San Fernando Valley, we have a multitude of professionals from diverse backgrounds who bring a richness of knowledge, expertise and experience to our profession. Sharing ideas among those from diverse backgrounds fuel innovation and keeps us sharp. Diversity and inclusion is a cornerstone of AFP Greater San Fernando Valley’s values that guides our governance, our organization and our programs. Diversity and Inclusion in Fundraising – seeks to achieve a broad representation of experiences, perspectives, and cultures to ensure that the best possible thinking, ideas, opportunities and solutions are considered; intentionally creates a respectful and welcoming environment that is open to all; and appreciates the unique contributions of every member of the community. Through our programs, AFP Greater San Fernando Valley facilitates dialogue among many voices as we share observations and practices with our peers. The Greater San Fernando Valley Chapter is proud to have received the Friends of Diversity Award for 2017. This award is given to chapters that have accomplished strategic goals and continue to advance philanthropy and the fundraising profession around the world.